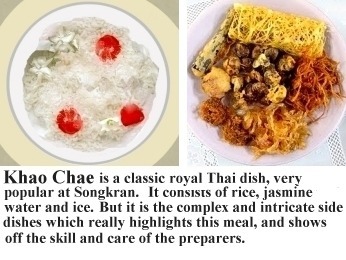 Thai cuisine is generally lightly prepared but has strong aromatic components. Detail, balance and variety are important. 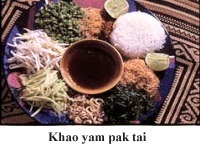 For each dish, or for the overall meal, Thai cooking has a balance of the four fundamental taste senses of sour, sweet, salty, and (sometimes) bitter. 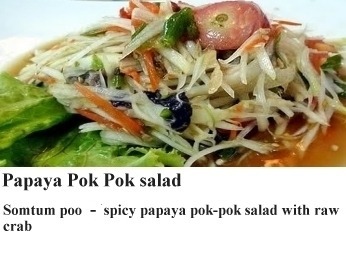 Thai food can be quite spicy. Thai cuisine, as a whole, is extremely varied and features many different ingredients and ways of preparation. Thai food is known for its enthusiastic use of fresh (rather than dried) herbs and spices. 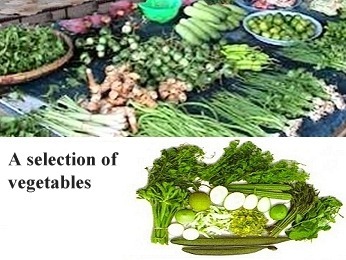 Common herbs include cilantro, lemon grass, Thai basils and mint. Other common flavors in Thai food come from ginger, galangal, tamarind, turmeric, garlic, soy beans, shallots, white and black peppercorn, kaffir lime and chillies. There are essentially four regional cuisines - representing the North, North East (Isaan), Central and Southern areas of the country. Regional variations tend to correlate with neighbouring countries as well as climate and geography. 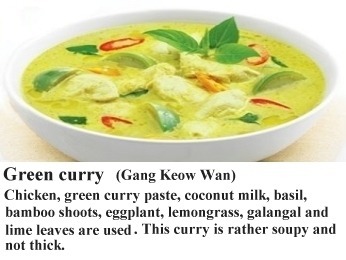 For example many of the curry dishes from the South contain coconut milk and fresh turmeric. 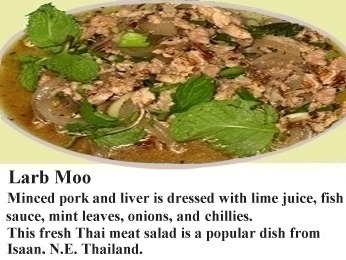 Northeastern dishes, which often include lime juice, are heavily influenced by Lao cuisine. 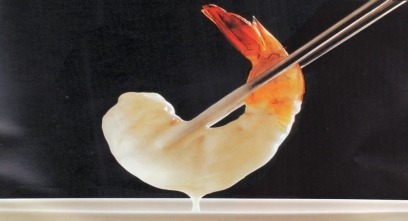 The influence of Chinese cuisine is also noticeable throughout the country. 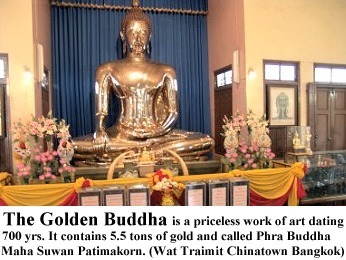 There is also the Thai Royal Cuisine which can trace its history back to the palace cuisine of the Ayutthaya kingdom, and its refinements, cooking techniques and ingredients were of great influence to the Central region. The ingredient found in almost all dishes in every region is nam pla , which is a very aromatic and strong tasting fish sauce. Fish sauce has many varities and is prepared with fermented fish that is made into a fragrant condiment with a salty flavour. Pla ra is also a sauce made from fermented fish. It is more pungent than nam pla , and, in contrast to nam pla which is a clear liquid, it is opaque and often contains pieces of fish. Rice is a staple grain of Thai cuisine. The sweet smelling jasmine rice is indigenous to Thailand. This naturally aromatic long-grained rice grows in abundance especially in central Thailand. Steamed rice is accompanied by highly aromatic curries, stir-fries and other dishes, Sticky rice, not jasmine rice, is the staple food in the local cuisines of Northern Thailand and of Isaan (Northeastern Thailand). Noodles are also quite popular, but usually come as a single dish. Noodles are usually made from either rice flour, wheat flour or mung bean flour and there are six main types. Thai dishes use a wide variety of herbs, spices, and leaves, such as kaffir lime leaves (bai makrut ). The characteristic flavor of kaffir lime leaves appears in nearly every Thai soup, or curry from the southern and central areas of Thailand. Besides kaffir lime leaves, several other tree leaves are use in Thai cuisine. The spiciness in Thai food originates from five main types of chillies. Fruit forms a large part of the Thai diet. 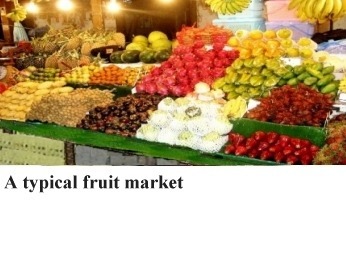 These include papaya, jackfruit, mango, mangosteen, langsat, longan, pomelo, pineapple, rose apples, durian and other native fruits. The World Durian Festival, in early May each year, is held in Chantaburi. This province alone produces half the durian production of Thailand and a quarter of the world production. 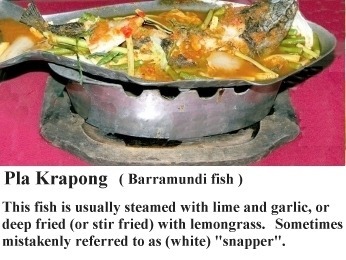 The following are some examples of cuisine in Thailand. 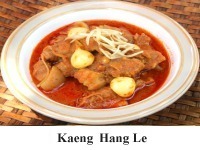 Kaeng hang-le - a Burmese influenced stewed pork curry which uses peanuts, dried chillies and tamarind juice in the recipe but containing no coconut milk. Kaeng khae - is a spicy northern Thai curry of herbs, vegetables, the leaves of an acacia tree (chaom) and meat (chicken, water buffalo, pork or frog). 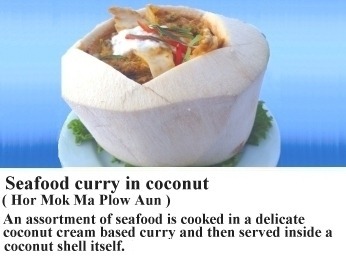 It also does not contain any coconut milk. 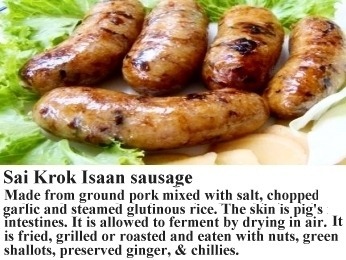 Sai ua - a grilled sausage of ground pork mixed with spices and herbs, similar to Lao sausage; it is often served with chopped fresh ginger and chillies. It is also sold as a snack at Chiang Mai markets. Nam phrik num - a chilli paste of pounded large green chillies, shallots, garlic, coriander leaves, lime juice and fish sauce; eaten with steamed and raw vegetables, and sticky rice. Nam phrik ong - resembling a thick Bolognese sauce, it is made with dried chillies, minced pork and tomato; eaten with steamed and raw vegetables, and sticky rice. Kaep mu - deep fried crispy pork rinds, often eaten with nam phrik num. Also eaten as a snack. Kai yang - marinated, grilled chicken. 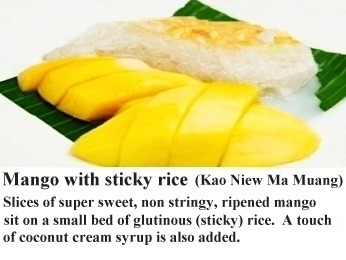 Khao niao - Glutinous rice is eaten as a staple food both in the Northeast as in the North of Thailand; it is traditionally steamed. Mu ping - marinated, grilled pork on a stick. 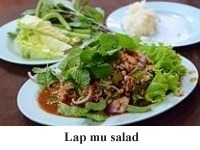 Lap - a traditional Lao salad containing meat, onions, chillies, roasted rice powder and garnished with mint. Nam chim chaeo - is a sticky, sweet and spicy dipping sauce made with dried chillies, fish sauce, palm sugar and black roasted rice flour. 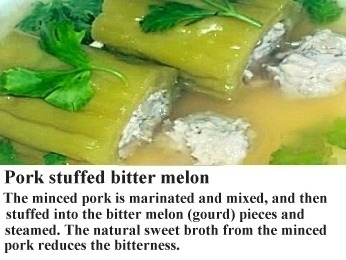 It is often served as a dip with mu yang (grilled pork). 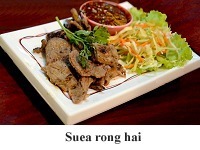 Suea rong hai - grilled beef brisket. Tom saep - Northeastern-style hot & sour soup. 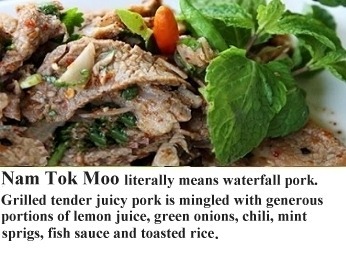 Nam tok - made with pork (mu) or beef (nuea) and somewhat identical to lap, except that the pork or beef is cut into thin strips rather than minced. Som tam - grated papaya salad, pounded with a mortar and pestle, similar to the Laos Tam mak hoong. There are three main variations: som tam pu with salted black crab, and som tam thai with peanuts, dried shrimp and palm sugar and som tam pla ra from the north eastern part of Thailand (Isaan), with salted gourami fish, white eggplants, fish sauce and long beans. Som tam is usually eaten with sticky rice but a popular variation is to serve it with khanom chin (rice noodles) instead. 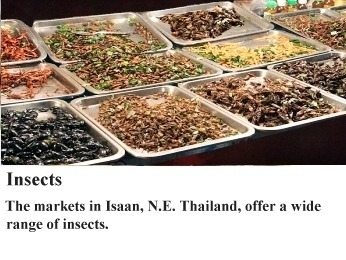 Insects - certain insects are also eaten, especially in Isaan and in the North. Many markets feature stalls which sell deep-fried grasshoppers, crickets (chingrit), bee larvae, silkworm (non mai), ant eggs (khai mot). The culinary creativity even extends to naming conventions. One tasty larva, which is also known under the name "bamboo worm" (non mai phai, Omphisa fuscidentalis) is colloquially called "freight train" (rot duan) due to its appearance. Most of the insects taste fairly bland when deep-fried, somewhat like popcorn and prawns, which is still fairly tasty, but when deep-fried together with kaffir lime leaves, chillies and garlic, the insects become an excellent snack to go with a drink. In contrast to the bland taste of most of these insects, the maeng da or maelong da na (Lethocerus indicus) has been described as having a very penetrating taste, similar to that of a very ripe gorgonzola cheese. This giant water bug is famously used in a chilli dip called nam phrik maengda. Some insects, such as ant eggs and silk worms, are also eaten boiled in a soup in Isaan. 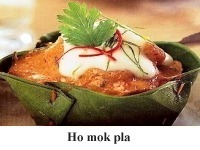 Ho mok pla - a pate of fish, spices, coconut milk and egg, steamed in a banana leaf cup and topped with thick coconut cream before serving. Kai phat khing - chicken stir-fried with sliced ginger. Kaeng khiao wan - called "green curry", it is a coconut curry made with fresh green chillies and flavoured with Thai basil, and chicken or fish meatballs. This dish can be one of the spiciest of Thai curries. 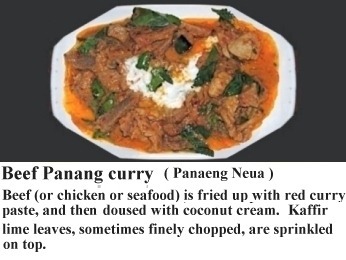 Kaeng phanaeng - a mild creamy coconut curry with beef (Phanaeng nuea), chicken, or pork. 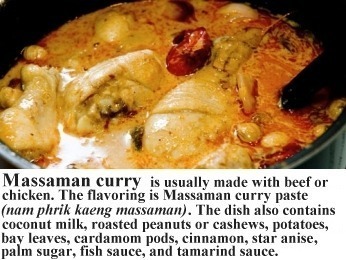 It includes some roasted dried spices similar to Kaeng matsaman. Kaeng phet ('spicy curry') - also known as red curry, it is a coconut curry made with copious amounts of dried red chillies in the curry paste. 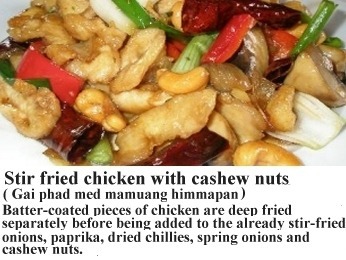 Kai phat met mamuang himmaphan - The Thai Chinese version of the Sechuan style chicken with cashew nuts known as Kung Pao chicken, fried with whole dried chillies. 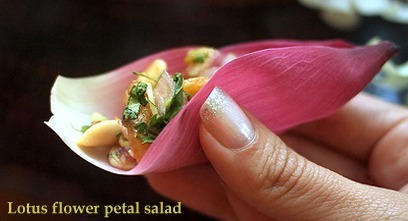 Miang kham - dried shrimp and other ingredients wrapped in cha plu leaves; often eaten as a snack or a starter. 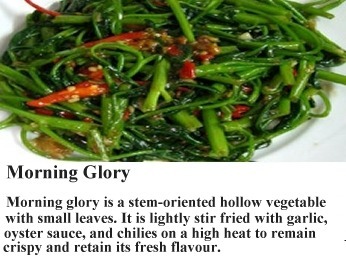 Phak bung fai daeng - stir fried morning-glory with yellow bean paste. 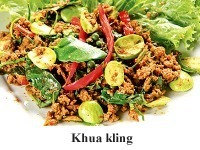 Phat khana mu krop - khana (gailan) stir fried with crispy pork. 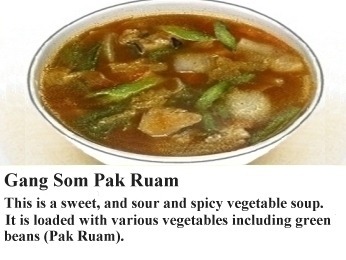 Phat phak ruam - stir fried combination of vegetables depending on availability and preference. Phat phrik - usually beef stir fried with chilli, called Nuea phat phrik. Pla nueng manao - steamed fish with a spicy lime juice dressing. 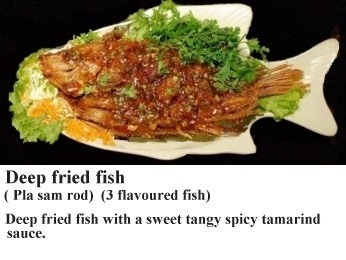 Pla sam rot - literally "Three flavours fish": deep fried fish with a sweet, tangy and spicy tamarind sauce. Pu cha - a mixture of cooked crab meat, pork, garlic and pepper, deep fried inside the crab shells and served with a simple spicy sauce, such as Sri Rachaa sauce, sweet-hot garlic sauce, nam phrik phao (roasted chilli paste), nam chim buai (plum sauce), or in a red curry paste, with chopped green onions. 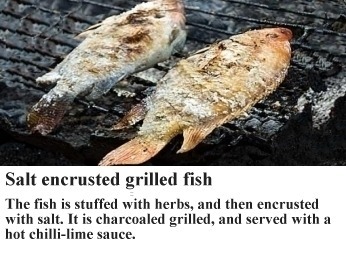 It is sometimes also served as deep fried patties instead of being fried in the crab shell. 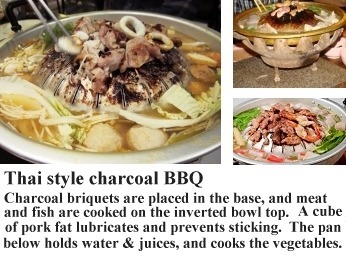 Suki - a Thai variant of the Chinese hot pot. 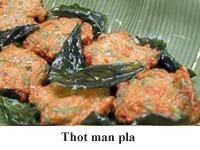 Thot man - deep fried fishcake made from knifefish (Thot man pla krai), or shrimp (Thot man kung). Tom chuet wun sen (Kaeng chuet wunsen) - a clear soup with vegetables and wunsen (cellophane noodles made from mung bean). Tom kha kai - hot spicy soup with coconut milk, galangal and chicken. Tom yam - hot & sour soup with meat. 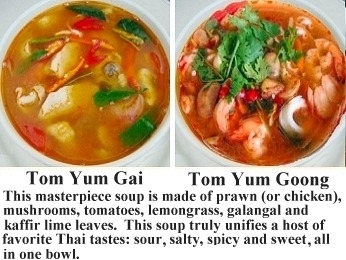 With shrimp it is called Tom yam goong or Tom yam kung, with seafood (typically shrimp, squid, fish) Tom yam thale, with chicken Tom yam kai. Yam - general name for any type of sour salad, such as those made with glass noodles (Yam wunsen, with seafood (Yam thale), or grilled beef. The dressing of a "Yam" will normally consist of shallots, fish sauce, tomato, lime juice, sugar, chillies and Thai celery (khuenchai) or coriander. Yam pla duk fu - crispy fried catfish with a spicy, sweet-and-sour, green mango salad. Kaeng lueang - a sour spicy yellow curry that does not contain coconut milk, often with fish and vegetables. Kaeng matsaman - also known in as Massaman curry, it is an Indian style curry, made of chicken or stewed beef and containing roasted dried spices, such as coriander seed, that are rarely found in other Thai curries. Chunks of boiled potatoes are also included. Kaeng tai pla - a thick sour vegetable curry made with turmeric and shrimp paste, often containing roasted fish or fish innards, bamboo shoots and eggplant. Khua kling - a very dry spicy curry made with minced or diced meat with sometimes yardlong beans added to it; often served with fresh green phrik khi nu (thai chillies) and copious amounts of finely shredded bai makrut (kaffir lime leaves). Sate - grilled meat, usually pork or chicken, served with cucumber salad and peanut sauce. Khao yam - a rice salad. Khanom chin nam ngiao - A speciality of Northern Thailand, it is Thai fermented rice noodles served with pork blood tofu in a sauce made with pork broth and tomato, crushed fried dry chillies, pork blood, dry fermented soy bean, and dried red kapok flowers. Khanom chin namya - round boiled rice noodles topped with a fish based sauce and eaten with fresh leaves and vegetables. Khao khluk kapi - rice stir-fried with shrimp paste, served with sweetened pork and vegetables. Khao man kai - rice steamed in chicken stock with garlic, with boiled chicken, chicken stock and a dipping sauce. 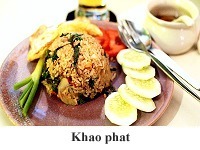 Khao phat - One of the most common dishes in Thailand, fried rice, Thai style. 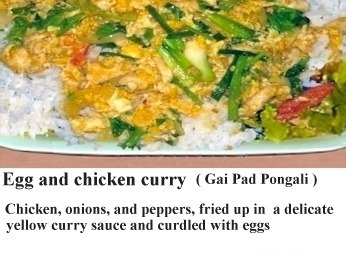 Usually with chicken, beef, shrimp, pork, crab or coconut or pineapple, or vegetarian (che). Khao phat American - American fried rice that can be found only in Thailand. Khao phat kai - fried rice with chicken. Khao phat mu - fried rice with pork. Khao phat pu - fried rice with crab meat. Khao phat kung - fried rice with shrimp. Khao soi - crispy wheat noodles in sweet chicken curry soup (a Northern dish). Kuai-tiao nam - rice-noodle soup can be eaten at any time of day; served with many combinations of proteins, vegetables, and spicy condiments. 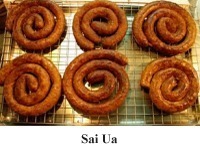 The word kuai-tiao, although originally designating only one type of noodle, the sen yai (wide rice noodles), is used colloquially for all rice noodles in general. Mi krop - deep fried rice vermicelli with a sweet and sour sauce. 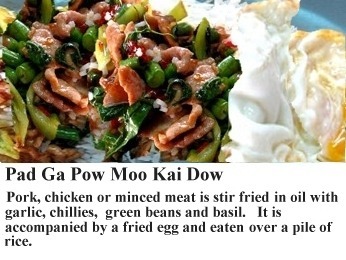 Phat khi mao - noodles stir-fried with Thai basil. Phat si-io - rice noodles (often kuai tiao) stir-fried with si-io dam (thick sweet soy sauce) and nam pla (fish sauce) and pork or chicken. Phat thai - rice noodles pan fried with fish sauce, sugar, lime juice or tamarind pulp, chopped peanuts, and egg combined with chicken, seafood, or tofu. 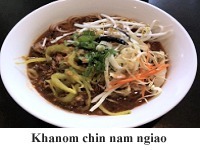 Kuai-tiao rat na - wide rice noodles in gravy, with beef, pork, chicken, shrimp, or seafood.